Strategic realities in Central Asia are likely to see Russia and India returning to their historically strong ties. In order to counterbalance a hegemonic, unipolar global order dominated by the United States, former Russian Foreign Minister Yevgeniy Primakov proposed in the 1990s the creation of a “strategic triangle” between China, India and Russia. While ten years ago it briefly appeared that this ambitious endeavor might have been possible, the vastly divergent interests of the three powers have prevented such broad partnership. Now Russia is once again undertaking to strengthen its relations with China and India in what some have likened to Barack Obama’s own “pivot” toward Asia. A full-fledged cooperative arrangement between China, India and Russia, however, seems unlikely because of the three countries’ competing interests in Central Asia. Instead, Russia’s designs to become more integrated with Asia will possibly lead to a stronger Indo-Russian relationship at the expense of a more solidified Sino-Russian partnership. The feasibility of Russia making a full orientation toward Asia came under doubt even before the West imposed economic sanctions in response to the current crisis in Ukraine. Nevertheless, Vladimir Putin continues to develop his country’s ties with Asia’s rising powers, including summit meetings with both China and India. India and Russia, while not as close these days as they were during the Soviet era, have still maintained cooperative relations, which appear poised to grow stronger. China’s historically problematic relations with both India and Russia have improved in recent years, despite lingering problems in the Sino-Indian relationship, including a festering border dispute, and continuing mutual distrust between China and Russia. Despite improved relations between the three countries and Russia’s recent steps toward the further development of relations with China and India, all three countries have competing interests in Central Asia. This is especially true of Chinese interests in Central Asia, which are more directly opposed to Indian and Russian regional imperatives than Indian and Russian interests are to each other. India wants to increase its leverage and influence in Central Asia, while Russia wishes to maintain and increase its predominant geopolitical stance. Yet India and Russia’s interests are currently not as diametrically opposed to each other as China’s interests are to both those of India and Russia. Russia, therefore, will most likely grow closer with India because China is the bigger threat to both India and Russia in Central Asia. Some may postulate that Russia will be able to bring China and India closer together. As Ankit Panda argues, however, Russia simply does not have the diplomatic leverage over Beijing or New Delhi to enact such an arrangement. India has begun to show greater interest in Central Asia, as political changes in Central Asia over the past 25 years have proven to be largely beneficial for India. The creation of five new countries after 1991, especially given the presence of war-torn Afghanistan and a hostile Pakistan, proved to be a source of “inspiration” for India. Today, India’s relationship with the Central Asian republics can be described as a “strategic partnership,” and India has sought to make sure it has an active role in the region. The increase in Chinese foreign policy activity in Central Asia was a major impetus for greater Indian involvement in the region. In turn, many Central Asian republics are interested in strengthening trade ties with India as they see an opportunity to become transit corridors for Indian merchandise shipped to Europe and the Commonwealth of Independent States. Under Nadendra Modi, India has begun to pursue a more assertive foreign policy that is less in line with the United States. Modi has stated that the idea of a unipolar world dominated by the United States has not materialized, and that greater cooperation between China, India and Russia is needed to maintain a global balance. India and Russia both enjoy a strong strategic partnership with each other, while despite calls for greater cooperation, India sees China as its main strategic competitor in Central Asia. 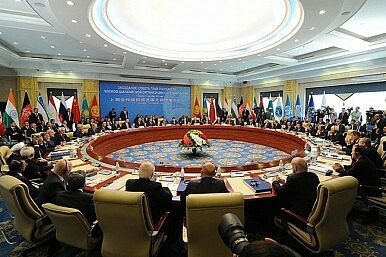 One of India’s main interests with regards to greater involvement in Central Asia is energy security. Umedjon Majidi describes energy security as the “key nexus” of India’s foreign policy. China, however, has proven to be an impediment to this, underscored by China’s demonstrated ability to maneuver into energy contracts in Central Asia that undercut both Indian and Russian interests. This is exemplified by China’s thwarting of the TAPI pipeline in favor of its own energy designs. Some Russian analysts have taken a more generous view of Chinese interests in Central Asia vis-à-vis Russian plans, and have criticized Russia’s political culture of demonizing China’s activities in Central Asia. Nevertheless, Moscow remains cautious about Beijing’s role in Central Asia, especially with China’s economic thrust into the region. One of the key mechanisms for Russia to monitor and handle a potential Chinese infringement of Russian interests in Central Asia is the Shanghai Cooperation Organization (SCO). The SCO represents a major framework through which the strategic relations between China, Russia and India will likely develop. Following a recent announcement that India, currently an observer state, would be allowed to accede to full membership, the SCO is one of the main mechanisms by which India aspires to increase its activeness in Central Asia. India’s move towards full SCO membership received top-level support from Russia. The increase in Chinese influence in Central Asia in the context of the SCO has actually set off alarm bells for Russia, and as such Russia has welcomed greater Indian involvement in the process, as India is the only other major power that can provide a feasible counterbalance to China. Of course, Central Asia is not the sole determining factor in the development of Russia’s current and future relations with China and India. Yet the immense geopolitical value Central Asia presents for these three powers means that a competitive relationship regarding Central Asia is likely to be a thorn in the side of truly healthy relations. As such, it appears that it will be unlikely that Russia will make a full-fledged “re-orientation” or “pivot” toward Asia in the form of a definitive strategic triangle with two of Asia’s great powers, China and India. The most plausible outcome from Russia’s attempts at solidifying its position in Asia is that both India and Russia, which have historically had a much better relationship than either has had with China, will once again form a deeper partnership in order to help preserve their own respective interests in Central Asia against the shared Chinese threat. Anthony Rinna is an American foreign affairs writer currently based in South Korea. India's SCO ChallengeReviewing India’s Foreign Policy Toward Europe Under Narendra ModiIndia-Pakistan Tensions Test the Shanghai Cooperation Organization's MettleIndia at the 2018 G20 Summit: Modi's OutreachHas Russia Lost Patience With India?